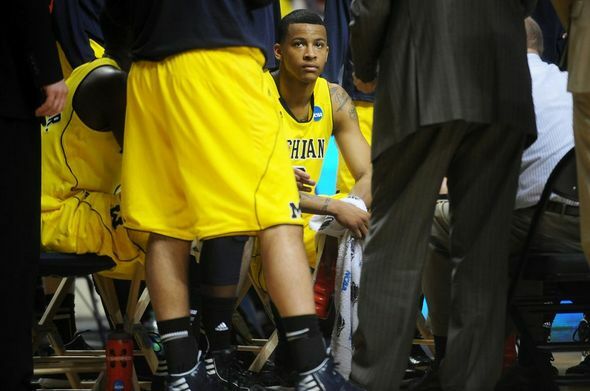 Posted on Sat, Mar 17, 2012 : 1:53 a.m.
Michigan freshman Trey Burke looks on during a timeout in the second half of the Wolverines' 56-50 loss to Ohio at Bridgestone Arena in Nashville, Tenn.
NASHVILLE, Tenn. -- For the better part of 35 minutes Friday, there was no question which point guard was having a better day. Ohio junior D.J. Cooper was breezing down the lane, flipping in layups, finding open teammates and hitting open jumpers, preserving the Bobcats' lead in the process. Michigan basketball point guard Trey Burke, meanwhile, was getting physically hedged on ball-screens, was struggling to finish at the basket and finding little room to get a shot off. "We put it in his left hand," said Cooper, who finished with a game-high 21 points as the Bobcats stunned fourth-seeded Michigan, 65-60. "We knew he was going to raise up and pull and we just did some scouting. "We switched the ball screens and tried to make him drive." Burke, who finished the season as Michigan's leading scorer, eventually found his own way, forcing himself into the lane to get on the foul line and knocking down deep, contested, 3-pointers during a personal 12-point run to get the Wolverines back in the ball game. But it took everything he had. And, even with his final flurry, Burke still finished with just 16 points -- meaning he only had four over the game's first 32 minutes. "They just bracketed my screens like Ohio State did," Burke said. "Whenever teams do that, it doesn't really frustrate me, but it allows me to get teammates involved. "Evan (Smotrycz) hit some big shots, Tim (Hardaway Jr.) hit some big shots, and that's how we kept it close." Burke was able to get teammates shots, handing out five assists, but he was limited to just 5-for-15 shooting -- and had to exert maximum effort for every point he did earn. Cooper, on the other hand, made it look effortless. He was able to break down Michigan's defense off the dribble, extend it with his shot, and make them pay for doubling, consistently finding open shooter Ivo Baltic -- who had 10 points on 5-for-10 shooting. "We thought we could handle them one-on-one and not give Cooper space by doubling down," Michigan coach John Beilein said. "The Achilles' there. Hadn't thrown out of the post all year long, and he ended up throwing out when we did double team one time on him. "They played very well inside. Cooper makes a lot of that go, now. He's as good a guard as we played against this year." There was no question entering Friday what the marquee matchup was. It was Cooper against Burke. And, aside from a gutty final five minutes, the victor left wearing green. Burke finished his freshman season at or near the top of several Michigan rookie record lists. He set the school's freshman assist mark earlier this season, and finished with 156 on the year, 16 more than former Wolverine standout Gary Grant. It's the 13th-best single-season performance in Michigan history. Scoring-wise, Burke led Michigan with 504 points (14.8 ppg), putting him 93 points shy of Jalen Rose's freshman record, set in 1992. He played 1,227 minutes this season, a freshman record and the second-most minutes ever played by a Wolverine. No one in the history of Michigan basketball has played in more games than Stu Douglass. And Zack Novak isn't far behind. Douglass become Michigan's all-time leader in that category during his final game, passing Loy Vaught with 136 games played. Novak, meanwhile, finishes his career in a tie for third on the list (134) with Glen Rice. Novak also finished third on the school's all-time games started list, finishing his career with 122 starts -- six behind all-time leader Louis Bullock. He also became the school's all-time leader in minutes played, finishing his career with 4,363. Michigan's loss to Ohio was the school's first NCAA Tournament setback to a Mid-American Conference opponent. ... Beilein falls to 8-7 all-time in NCAA Tournament games, and Michigan is now 2-3 during his era as head coach. ... Smotrycz fouled out Friday, the sixth time that happened in 2011-12. Mon, Mar 19, 2012 : 3:57 a.m.